It’s pretty simple, who doesn’t love mac and cheese? And further who doesn’t love a good boxed mac and cheese, we all have a place in outr hearts for this pre-made yumminess. And in all honesty, adding a hot dog is not beyond something that I have practiced in our kitchen for a quick meal. Of course I have grown out of that stage onto better brands, like Annie’s Homegrown Organics, and better brands for sausages and hot dogs. I used an all beef Organic no nitrite dog for this recipe. I have to tell you, this meal made me so happy, in a different kind of way. It was quick, and comforting. But that kimchi, whoa. Kimchi and mac and cheese are my new favorite thing. I even text Brian while I was eating this. So when Annie’s reached out to me to share a quick family recipe using this mac and cheese, I was on board. We all need a quick meal from time to time, and adding vegetables, or good chicken sausages can make this boxed meal, a whole good meal. Kimchi has become a regular part of my diet, so it was kind of a match made in heaven when I put these together. The giveaway is over, and the winner has been chosen. Thank you! The winner will receive: 3 boxes of Mac and Cheese, 2 boxes of Annie’s Snacks, Coupons, Chino Bag & Team Annie’s Spork. Simply comment on this post- What are your favorite stir in’s for your mac and cheese? Winner will be chosen Saturday October 25th 12am PST. I will email the winner, and winner must respond within 48 hours. If not, I will choose another winner. 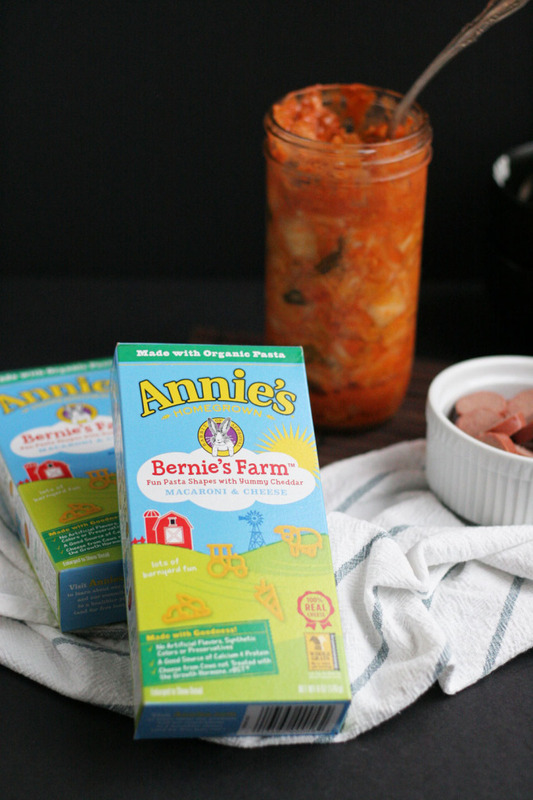 Check out other Annie’s #MixinMondays and #teamannies recipes. 1. Prepare the mac and cheese by following the instructions on the package. Once finished, stir in kimchi and sausage. More disclosure: I’m required to disclose a relationship between my blog and Annie’s Homegrown. This could include Annie’s providing me w/ content, product, access or other forms of payment. Extra cheese 🙂 and broccoli. I also love broccoli in my mac and cheese! I’m definitely making your kimchi tomorrow if I have time to run to the store. And I’m probably going to pick up some jarred stuff so I can have it with mac & cheese because this sounds really good right now. Let’s see….favorite add-in. I guess it would have to be a big ole spoonful of chili. I love a big bowl of chili Mac and cheese. what a great flavor, super fun Mac and CHEESE you have here! 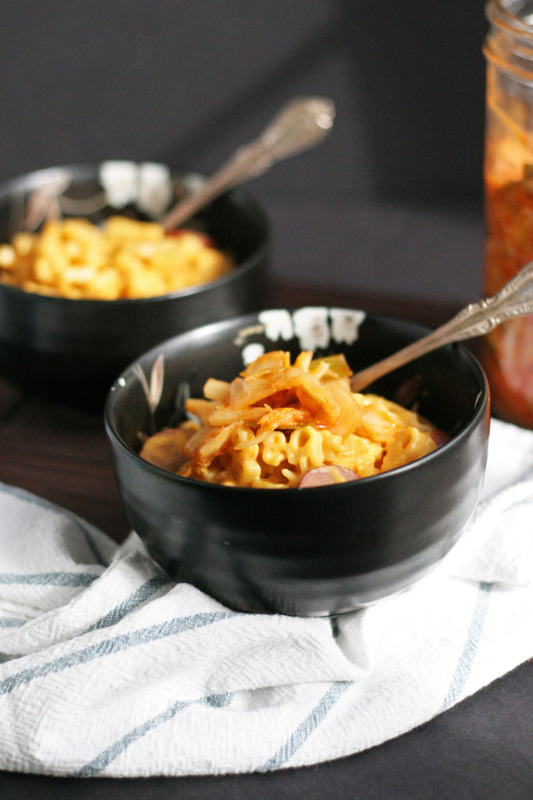 Why have I never thought of kimchi in my mac and cheese!? I like sriracha in my mac or mash potatoes! Whenever I get corn bread and mac and cheese from Boston Market, that combo is pretty good too. Dip it in the meatloaf gravy. Oh man this is making me hungry.! 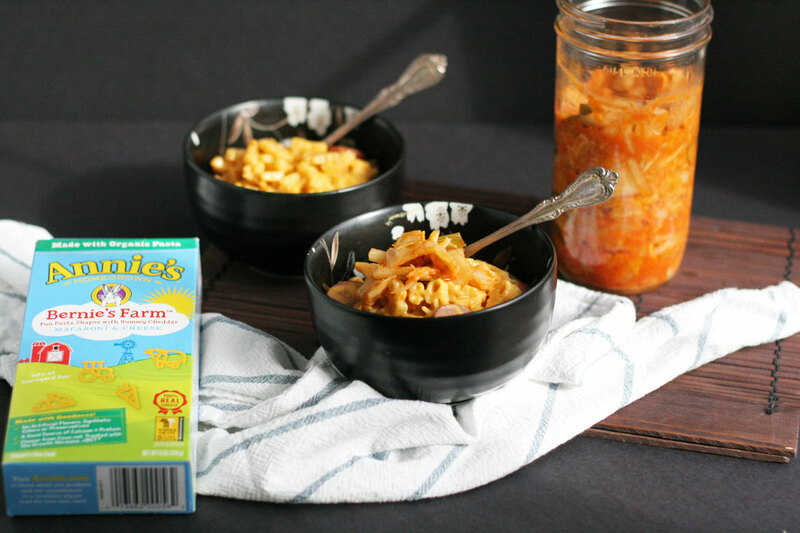 I love adding spicy to mac and cheese, that’s how this came about! Oooooooh no way?!!! Yummmm. Good idea! Kimchi! That is SUCH a good idea. You know I am all about getting as much cabbage into my body as possible. 🙂 Actually I think I might have to pick raw cabbage as my favorite mix-in! It’s such a nice texture contrast. Thanks for the giveaway opportunity! Ha! So true, cabbage is so good. I cut the kimchi cabbage pieces larger so they don’t get lost in food we add it to. Mac & cheese with stir-ins was always my go-to in college, I love that you’ve classed it up here! I was always fond of spicy chicken breast (seasoned with paprika/cayenne/cumin) and broccoli. This sounds sooo good! Will definitely be trying this with some veggie sausage! When it comes to Mac and cheese I am of the belief if it tastes good with cheese on it throw it in! Typically I do broccoli and cholula. Or just cholula sometimes. Mmm! I’ve done various morning star parties as well and one memorable occasion of oyster crackers. College has been a weird time for me… But quite delicious and enlightening. Well, most of the time anyway. Cholula is the best in mac and cheese. It’s kind of where I got the spicy kimchi idea! I do love broccoli too! How super duper fun! You won the giveaway :). I’ll email you!